Porsha O., a spoken word poet from Boston, gives a performance in Talley Ballroom Tuesday, Oct. 24 during Diversity Education Week. Porsha O. presented poems and haikus addressing topics such as sexuality and oppression. Before her performance, Porsha O. hosted an interactive writing workshop called Gate Keepers Workshop: On Examining Privilege. 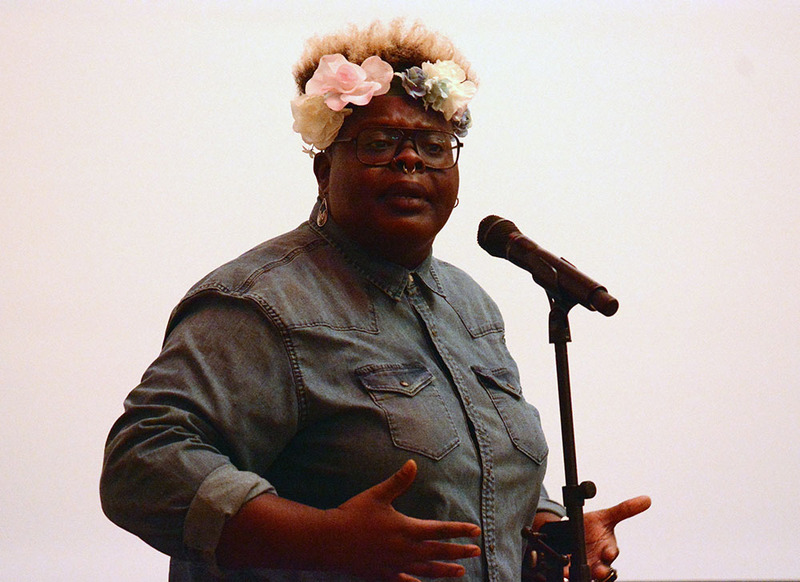 During Diversity Education Week, the Union Activities Board’s Diversity Activities Board invited well-known poet and feminist Porsha O. for a writing workshop and spoken word performance. Her writing workshop also acted as a workshop about diversity that included themes of structural racism, sexism and systemic oppression. These systems were the themes of the workshop. The participants were tasked with analyzing a scenario that featured characters that were analogous to entities involved in the experience of oppression: minority groups, authority figures, institutions, white men and the Bill of Rights. Porsha O. closed the workshop by urging participants to have more dialogue about diversity on campus. Following the workshop, Porsha O. performed in Talley Ballroom. She was introduced as “coming in on a dragon,” and the power of the image set the tone for the poetry she performed. Porsha O. talked about her life experiences and how they contributed to her poetry, finding inspiration in unexpected and mundane places. Two poems she performed were inspired by Disney movies, and they were especially geared towards illustrating racism and microaggressions. The first, a new poem called “The Genie Takes a Walk 150 Years After Being Emancipated,” used the plight of the Genie in “Aladdin” and hypothetical situations as an allegory for modern expectations and prejudice. The poem and its message, as well as her performance, resonated deeply with audience members. Porsha O. also managed to illicit an emotional response with the poem “One Black Boy Down.” Several attendees were seen wiping their eyes as the poem reached its conclusion. The second-to-last poem Porsha O. performed was “Capitalism,” in which she is capitalism personified as a pimp who built America. “I am Capitalism. Racism is my son, Gentrification is his sister, the Jail System is my illegitimate daughter and Public Schools are my bad a** grandkids. Can’t you see? All your oppression is related back to me,” she said. Porsha O. said she chose the poem specifically because it was Diversity Education Week, and one thing we all have in common is that we live under and are oppressed by capitalism. She ended her performance with the poem “Ode to My Mouth,” which celebrates the power of speaking up and individuality.